W.H. 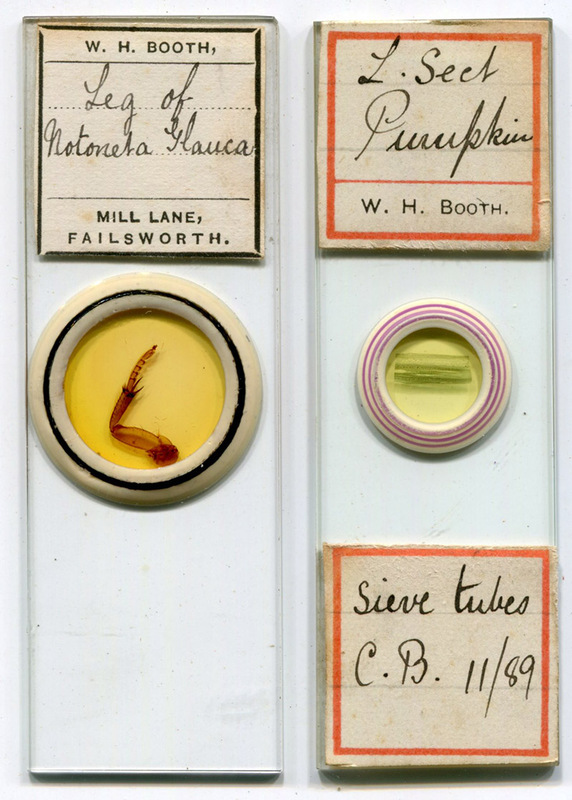 Booth produced a number of good quality microscope slides over a period of roughly 17 years. His surviving slides generally have multi-colored ringing, and custom-made labels (Figure 1). The high quality reflects his long-term membership of the Mounting Section of the Manchester Microscopical Society, which was a group dedicated to developing skills in slide-making. Figure 1. Microscope slides by W.H. Booth. He lived at 4 Mill Lane, Failsworth, from ca. 1881 until 1892. The slide without an address is dated 1889, indicating that he also used unaddressed labels during his time at Mill Lane. The note “C.B.” indicates that Booth mounted the specimen in Canada balsam. William H. Booth had a relatively brief life, dying when only 36 years old. He was born during early 1864, in the Failsworth area of Manchester, England. He was the oldest child of William and Ellen Booth. Six other children followed him. Father William was a “warehouseman”. That is an ambiguous term that can mean anything from a warehouse manager to an unskilled worker in a warehouse. Censuses and his children’s birthplaces indicate that the Booth family moved several times, something that might occur with a skilled manager, but probably not with a manual laborer. W.H. Booth, our microscopist, was listed in the 1881 census as “apprentice brewer”, and the 1891 recorded his occupation as “brewer”. He joined the Manchester Microscopical Society at some point before 1883 (the society was founded in 1880). He was a member of the Mounting Section from at latest 1884 until his death in 1900. William H. Booth’s father died in 1886, aged 44. William and his siblings remained with their widowed mother. He did not marry. Some of Booth’s slide labels bear the address of Mill Lane, Failsworth. He and his family moved there at a time between 1881 and 1883: the 1881 census lists their home as 3 Borden Street, Newton Heath, Manchester, while the 1883 list of Manchester Microscopical Society members gives his address as 4 Mill Lane. They remained at that address until 1892. The 1893 list of MMS members recorded a move to 4 Mount Pleasant, St. Mary’s Road, Moston, Manchester. He left that address in 1897, moving to 669 Oldham Road, Newton Heath. William Henry Booth died there on October 8, 1900. Figure 2. 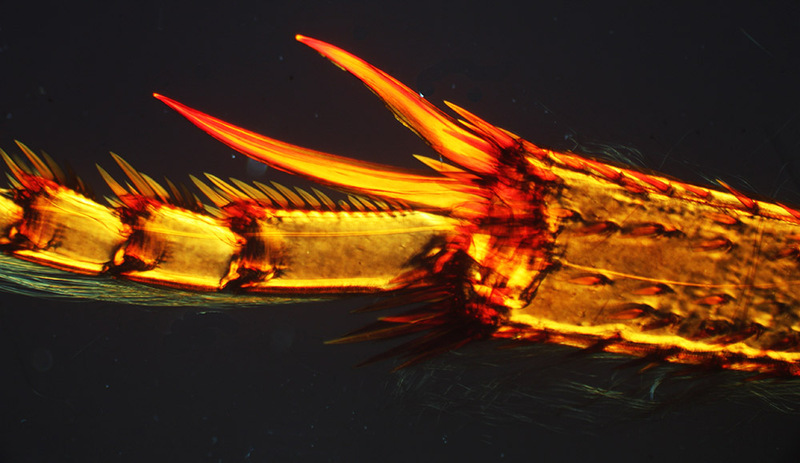 Leg of “Notoneta glauca” (actually Notonecta glauca, a common “backswimmer” Hemiptera), viewed with crossed polarizing filters and a 3.5x objective lens (without a selenite).